The below artworks are the most important by Robert Delaunay - that both overview the major creative periods, and highlight the greatest achievements by the artist. 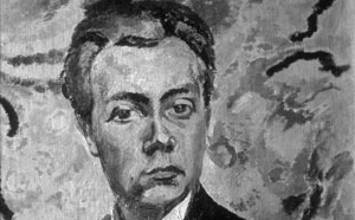 Artwork description & Analysis: This portrait is one of a series that Delaunay and Metzinger painted of each other during the summer of 1906, many of which have been lost. Delaunay's painting captures both the debonair air of Metzinger and their spirit of collaborative experimentation. This painting shows the influence of Neo-Impressionism and Divisionism on Delaunay's color as well as the influence of artists such as Edgar Degas and Édouard Manet in its unusual perspective. Like Seurat, Delaunay placed complementary and opposite colors adjacent to each other on the canvas rather than mixing paints on the canvas - creating the effect of a hue and the illusion of depth, while giving the works a sense of static classicism. Delaunay was not a slavish follower of Divisionism, however, since his brushstrokes are freer and less precise, and the color is not dictated by nature but is non-naturalistic, indicating Fauvist influences. Artwork description & Analysis: Saint Severin was the first major series of paintings created by Delaunay in 1909. Focusing on the Gothic ambulatory of this well-known Parisian church, he depicted the view multiple times from the same perspective - looking northeast to capture the effects of changing light as Monet had achieved with his analysis of the exterior of Rouen cathedral. Restricting himself to the subdued palettes the early Cubist works of Picasso and Braque, Delaunay also looked to these artists' use of fragmented planes and distorted form to structure his space. The result is a modern rendering of a Medieval church through a series of repeated arches framed by the cropped composition. Delaunay's technique involved studying the 'reactions of the retina while looking at the sun' - documenting the colors and contrasts created, as well as the distortions in architecture through modulations of light. Artwork description & Analysis: Delaunay painted his first Eiffel Tower in 1909 to celebrate his engagement to Sonia Terk. He went on to produce around fifteen versions and the tower became a major motif for artists in recognition of the major role that technological development and innovation had on the first part of the 20th century. The Cubist influence is present in both the fragmented panes of the composition and in the multiple viewpoints of the tower - by looking both up at it's towering height and down on to the smaller buildings. The rich red color is heightened in contrast to the pale blue background, which again emphasises the tower's dominance on the Parisian skyline. His work was described as a synthesis of Impressionism and Cubism but the dynamic robotic-like presence, wing-like forms and plumes of smoke or clouds are more reminiscent of the Futurist project. As Mark Rosenthal noted , 'Delaunay 'effectively replaced the pastoral landscape of the Impressionists with a modern paen of French glory" even reducing his color palette to the red, white, and blue of the French flag. Artwork description & Analysis: This painting figured prominently in the art world of pre-World War I Paris and was one of the first acquisitions of Jean Cassou, a freelance journalist and later the director of the Museum of Modern Art during the turbulent days of the Socialist Blum government prior to World War II. First shown in the Salon des Independants in 1912, the work caused a sensation and was noted by Apollinaire to be an example of the new movement, Orphism. In 1913, the painting, along with other, smaller compositions, was sent to New York for the now infamous Armory Show. Sadly the work was never shown due to its great scale, causing indignation for the Delaunays and their close circle of friends. Artwork description & Analysis: For this work, Delaunay drew inspiration from a newspaper image of the Paris-Cardiff rugby match that took place in 1912. He produced several versions of the painting - combining representational elements with a fragmented, Cubist composition that shows the emergence of contrasting color planes and geometric forms of his later work. The motifs he employs all work to illustrate the visual landscape of pre-war Paris- branded hoardings, the Big Wheel, and the Eiffel Tower rising up majestically in the background. Off to one side, partially concealed and disguised as an advertising slogan, is Delaunay's name. The inclusion of visual and written symbols in the painting point to significant themes that were to preoccupy the artist throughout his career- the depiction of movement, technology, sport, and placing himself as a central figure within this dynamic new world. Artwork description & Analysis: The Simultaneous Windows series are Delaunay's last semi figurative works before he began experimenting with complete non-objectivity. Here we are looking through a window - the outline of the Eiffel Tower reveals itself beneath fragmented color panes, creating an illusion of depth along with the kaleidoscopic effect that was characteristic of Orphism. The palette is bright and the fluid blocks of color give the illusion of softness and movement. In 1911, Sonia had created a patchwork blanket for their son that famously inspired these works. The Windows series is characterized by a forward thinking and Futurist aesthetic but Delaunay also drew on earlier movements, the motif of looking through windows could be seen in works of the Impressionists and Fauvists and could also have been inspired by the Symbolist concept of a window onto the soul. Artwork description & Analysis: Endless Rhythm was named by Sonia Delaunay as a way to describe the cyclical looping effect of the circular forms that seem to mimic the flow of electric currents. By 1930 Delaunay had returned to abstraction, producing the large spinning disc compositions for which he is perhaps best known. Building on his earlier experiments, Delaunay achieved the illusion of movement through juxtaposition of colors with geometric form. Delaunay carefully selected his colors to present subtle gradients and then contrasts these with the thick black and pale blue background. The diagonal composition enhances the effect of dynamism. A year after this painting was produced, the discs were brought to life on a monumental scale in his public murals for the Paris exposition. Artwork description & Analysis: In 1937 the Delaunays began a new and very different project that would occupy them for almost an entire year when they were commissioned to create a series of murals for the Railway Pavilion and the Air and Aeronautics Pavilion at the Paris Exposition in collaboration with a team of painters. The theme that year was art and technology in modern life. In response,Delaunay chose to recreate the results of his earlier experimentation with simultaneity and chromatic color - this time on an unprecedented scale. Each panel took a different form; inspired by his earlier work in sand, stone, and sculpture. Delaunay imagined repetitive forms, conflicting shapes and endless color palettes to set the room in motion, in homage to new visions of the world afforded by technological innovations. The murals were hung in the entrance to the Musée d'Art Moderne in 1977 in honor of Delaunay's earlier contributions to abstract art. Artwork description & Analysis: Propelled on by the success of the Exposition commission, a year later Delaunay produced another major commission, this time for the Salon de Tuileries. Again reminiscent of aeroplane propellers, and the swirls and plumes that surround them in motion, this painting evokes the artist's love of speed and technology, as well as his renewed commitment to pure abstraction. It also illustrates his application of color theory. By using the large scale he had become comfortable with, Delaunay heightened the visual sensation of the work by creating simultaneous form and depth rather than descriptive reality. This was to be Delaunay's last major piece before the couple fled Paris for the south of France, where Robert died a premature death just three years later.